Samson is an older guy that has been in a home since 2009. He is a huge guy that towers over most other greyhounds and weighs close to 100lbs but could stand to lose a few lbs. We don't have a lot of information about his past or his racing name. He will celebrate his 9th birthday in May though. 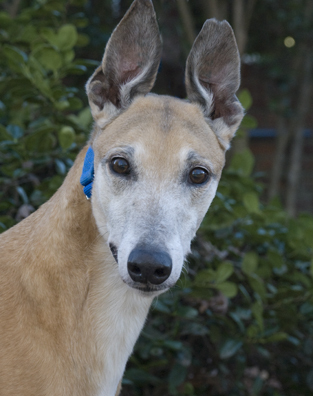 Samson was returned with his 10-year-old housemate Delilah to the Birmingham Race Track Adoption Kennel. She is still available in Birmingham and arrangements could be made to bring her here too if a family were interested in adopting both together. They were returned due to a family situation and not because of a problem with the dogs. Samson did not pass his cat test but was good with the small dogs in his foster home. He is a calm, sweet, gentle giant. Because he is an older guy he qualifies for our reduced adoption fee of $200. Samson arrived with a slight limp that got worse in the next two weeks. He was diagnosed with terminal bone cancer. His foster mom decided to just adopt him and love him for the time he has left.